The House has withdrawn its plan to eviscerate the Office of Congressional Ethics. Many headlines gave credit to Drumpf’s tweet about the issue, when in fact representatives actually backed down because their offices were flooded with angry phone calls from constituents. Congressional Ethics existed, the newly sworn-in House has kicked off its agenda with a vote to dismiss complaints if the ethics committee were deadlocked; and in 2010, House members pushed to limit the OCE’s ability to report ethics violations to the Justice Department but backed off so as not to look bad in an election year. This will come back. Drumpf’s tweet didn’t tell the House to drop the issue; he just said they should cut taxes and repeal the ACA first. If you don’t remember what things were like before the OCE existed, The Atlantic has a nice overview of its creation. The resolution to ban livestreaming and photography from the House floor passed, without the OCE amendment attached. If you don’t have your representatives’ numbers handy, call the Congressional switchboard 202-224-3121 and ask to be transferred. Add that number to your contacts! It’s consistent, unlike the representatives’. Look at the graphic. 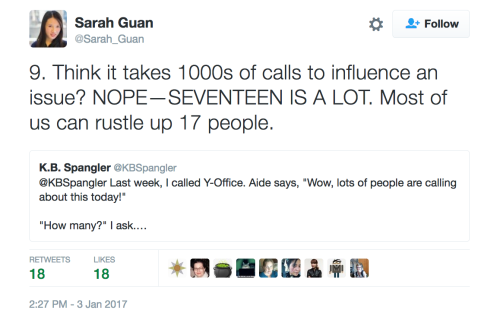 17 phone calls!!! Really don’t need thousands, just 17 to your reps. If you see a request to make a call, do it. Even if you live in a red state and you know they will never ever budge. Call after hours, leave a message. If you hate phone calls, fax - copy and paste the script and use an online fax service.